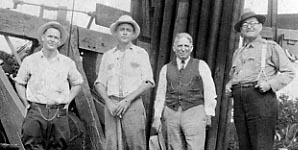 Claude "Buck" Luttrell (left) on oil rig near Sealy, Texas abt 1930. Click here to see larger image. Claude Atherton "Buck" Luttrell, Sr.
Notes in CAL, Sr. Diary re: "Companies and oil well drilling contractors I have worked for since Oct. 15, 1910. . .Texas, Oklahoma, Louisiana, Arkansas, Tennessee, South America"
CAL, Sr. Diary listing for Sept. 11, 1931. . .
"God let the light of thy truth so brighten my pathway this day that it will be impossible to stumble and fall. Let me watch my step carefully that at the end of the day I will find my self nearer to thee. Give me an understanding hart and a courageous spirit for the hard things of life. And may the toil of my hands and my head Be a blessing to others. In Jesus name I ask it. Amen. 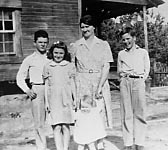 Buck was the fourth child of eight born to Lewis Palmer and Louisa “Kate” Katherine Brown Luttrell. Claude’s parents divorced when he was about eleven years old. 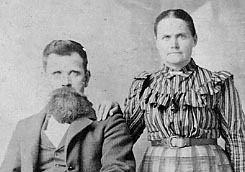 His father then lived in Karnack, Texas and Claude and his siblings went to live with their mother in Alden Bridge where she ran a boarding house. Records show that he did not advance beyond a fourth grade level in school. Claude, or “C. A.” or “Buck” as he may have been known, like his older brother Elmer, worked as a “wildcatter” in the oil fields near Oil City, LA. He began working in the oil fields in 1910 and drilled his first well there in 1913 when he was 19 years old. 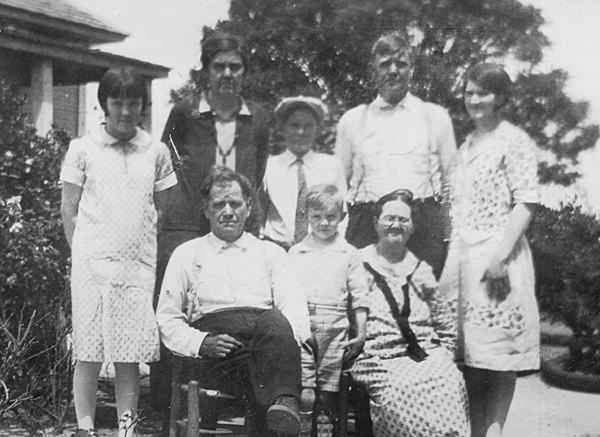 In July 1917, Buck volunteered for the Texas National Guard in Angleton, Texas. On August 5, he entered the Army and served in Company H (Co. C acc to V. A. records), 143rd Infantry regiment, 71st Brigade, in the Texas/Oklahoma 36th Division which trained at Fort Bowie in Fort Worth, TX. While training at Fort Bowie Buck fell off a wall and injured his back. He was in the infirmary for two months. He later reinjured his back while training during his service in France. On October 6, 1918, while fighting in the Meuse (River) - Argonne (Forest) Campaign he was gassed and shell-shocked, knocked unconscious, and was in the hospital three weeks before regaining consciousness. At first, he was presumed to be dead and his family was sent a military notice of his death. 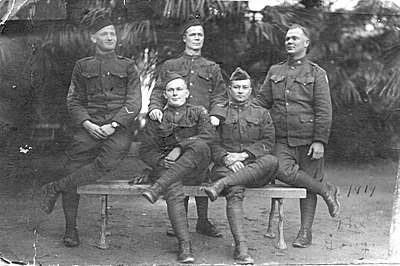 The War ended 11 Nov 1918 with the signing of the Armistice. He was discharged with the rank of Corporal on 14 Jun 1919 in Fort Worth, Texas. He likely went back to work in the oil fields upon his return home after the war. In 1923, his right middle finger was removed by Dr. Travis (or Graves) in Monroe, LA. In 1924, his right eye was removed by Dr. Boaz in Shreveport, LA. This injury occurred while drilling an oil rig. He subsequently wore a glass eye. Buck was working in the oil fields of Venezuela, South America, in 1928 when he received word that his mother had a severe illness. He received a telegram from his brother Elmer on Jan 13 telling him to come home. He sailed from Maracaibo, Venezuela on Jan 15 and arrived in New York on Jan 25. He arrived in Shreveport on Jan 28. Unfortunately, his mother died January 18, 1928. 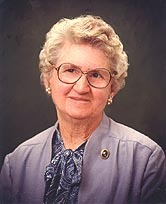 Laura Estelle Hammett Luttrell, my grandmother, wrote of meeting Buck after he came home from South America due to his mother’s death. She was staying in the home (boarding house?) 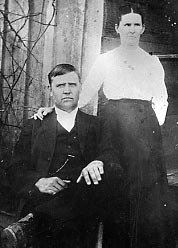 of “Uncle Milton and Aunt Jeanette” (Smith) as did Buck when he was in town (maybe Colfax, LA). 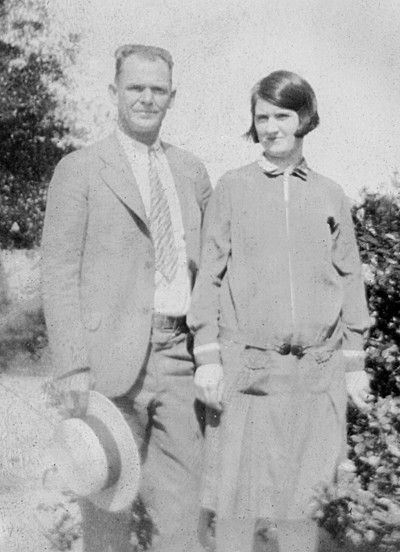 Claude Atherton “Buck” Luttrell married Laura Estelle Hammett on Oct 11, 1929 in Bellville, Texas. 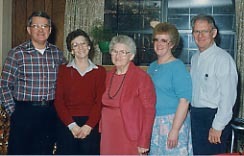 (l. - r.) Grady, Laura L., Laura Estelle, Mary & Claude, Jr.